This is just INSANE! DC Shoes owner and rally Car driver, Ken Block has taken his automotive antics to all-time heights. I give you the DC Shoes Subaru WRX STi Snow-Cat! 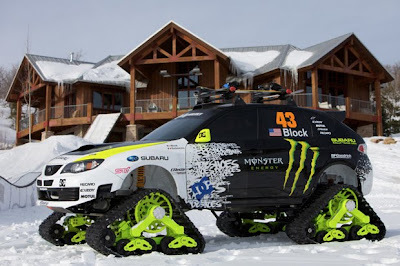 Take the already insane Ken Block Edition #43 STi Rally car, and give it the full snow treatment, loose the tires for snow-cat TRAX, add some beefy next-level suspension and components, what comes out is simply nuts. Some of the upgrades include Group N competition rally dampers, and a KAPS 5 speed, close-ratio, dog-engagement gearbox. Under the hood sits a 2.5 liter, 4-cylinder, turbocharged, intercooled STi boxer engine tuned with a MOTEC M800 ECU. This giant snowmobile puts out 400hp and can carry 4 snowboaders and their gear to the back-country spot of their choosing. Not only that, but they can literally "fly in style" to spots that lifts and roads dont go; stereo blasting, heater on and guns blazing. Respect DC, you guys are pushing the limits of everything... WATCH THIS VIDEO!